Last week we took a new route for our trip to France and travelled through the Channel Tunnel. With nothing to do or see for 30 minutes what else can a girl do but get out the sewing kit? So where is the strangest place that you have sewn? Excellent! I am going to up my stitching game and find an interesting place! nowhere interesting - exotic maybe but not unusual!! You could be starting a trend here..
That is certainly a very interesting and adventurous place to sew. My "unusual" place to sew is the car. I love when my husband drives and I sit on the passanger's seat stitching away. The dentist office. Not near as adventurous as you ; ) Were you nervous under the sea? I have not been over or under the Channel but coming back from the K & S show in Dublin where I was working a few years ago quite a few of us sat and stitched together, happy days. I can see you're laying down a challenge for us! 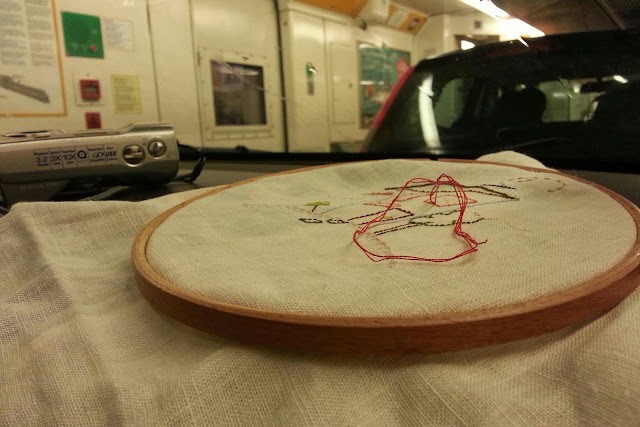 Like Martha I sew in the car (when I'm a passenger that is ;) ) it makes the journey go faster. Watching the boys Kickboxing! It felt far too feminine to be doing in such a smelly male environment!!! Um, arctic circle? Think you are winning!